Having long been the subject of rumors, speculation, and ESRB ratings, the Devil May Cry HD Collection is now a real snow-haired, demon-slaying boy, and we've got the comparison shots to prove it. The collection brings together remastered versions of the first three titles in the Devil May Cry series, from Dante's big debut to the special edition of Devil May Cry 3: Dante's Awakening. Each of the three games will look prettier than they would if you just popped a PlayStation 2 disc into your PlayStation 3, especially if you take into account that most of today's PS3s wouldn't even run it (*hugs his 60GB*). Expect a little bonus content, as well as support for trophies and achievements. 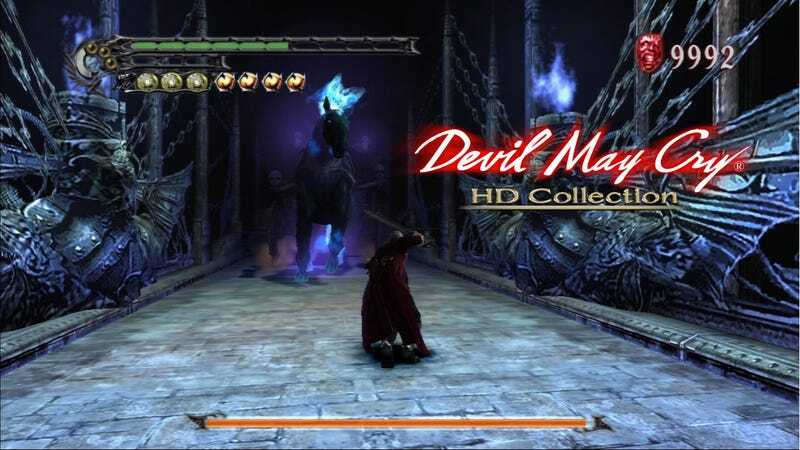 It's three, three, three Dante's in one when the #39.99 Devil May Cry HD Collection hits the PlayStation 3 and Xbox 360 early next year.